I’ve had a break from the day-to-day management of our band’s online presence. After a big tour, life took precedence for a while. I’ve quietly worked on some demos and largely left our Facebook page alone. As the creative work has started drawing my mind back to band and brand management, I’ve become curious about it all again. Logging into our social media accounts, I was surprised to see that bands are still spamming their fans about gigs. As a fan, the constant messaging about every little show in territories other than my own doesn’t add a lot of value. Hey, I’ve certainly done my fair share of similar “promotion” — learning as I go. It seems reasonable that followers would want to hear about upcoming shows and multiple posts are probably needed to reach the whole demographic to hopefully convert more sales. There is the emotional motivation, as well as financial, to broadcast to the maximum audience and achieve the best attendance. Looking at our online behaviour with a new perspective, it now reminds me of a major faux par in the recruitment industry: treating social media like a job board (or for the purposes of this piece, a gig guide). Raising awareness is important but the volume of promotional posts is problematic; engagement is an art. Personally, I follow bands online because I want a view behind the scenes, to communicate with them, and in some cases as advocacy (to identify with and promote them in my networks). However, often the band members’ personal profiles are more interesting because they are less saturated with calls to action than the band’s own channels. Here’s what I learnt from being a fan for a while. The most successful community channels are the ones in which artists use a content strategy with a palatable ratio of self-promotion. The issue of over-promoting gigs is actually one of curating better content generally. There are a number of good guidelines around this. I like the following in particular. Telling better stories in social channels is good for the artist’s own enjoyment of the platforms. Independent musicians need low-cost, sustainable marketing tools to drive awareness and support. The potential of social media is huge; however without a purposeful strategy it easily becomes a chore. “I swear this is the last time I post this…” and “I know you’re all sick of it, I’m sick of it too…” are real examples from musicians I follow who are at times disenfranchised by relentlessly self-promoting gigs to their community. Cross-posting is a lazy way to update multiple social media profiles via a third party app. Having painstakingly listed hundreds of gigs across multiple websites manually, I can understand the appeal of a centralised solution. The standalone services are useful (by all means use them, their Facebook tab, mobile app, whatever); however, automated posting of all your concert listings to your social presence does have a negative impact. Recently, I saw on one (signed) artist’s Twitter profile nine Bandsintown cross-posts in a row within a 30-minute period. 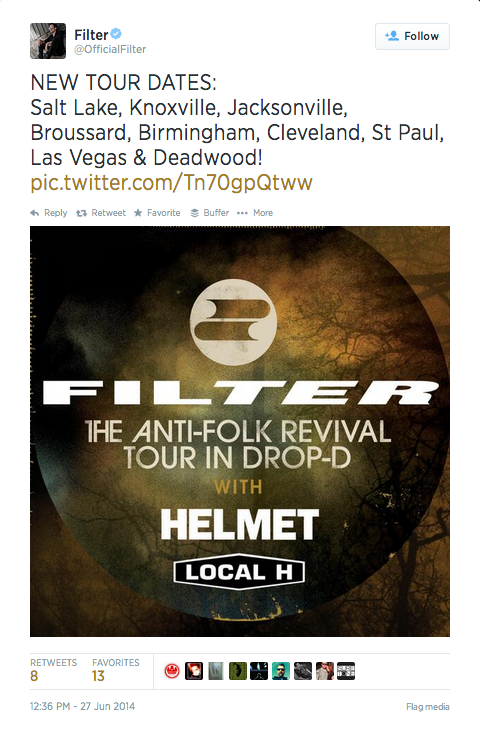 90-minutes later, the band posted one update natively from Twitter announcing all cities on the tour with an image attached. The native post outperformed the average of those third party posts by 10.3 times more retweets and 5.6 times more favourites. Aside from quantity and frequency, another problem with cross-posting is the lack of optimisation for the idiosyncrasies of a particular social network. Unfortunately, there is no perfect native solution for events on mainstream social platforms either; Facebook Events were helpful a few years ago but aren’t a reliable indication of actual attendance (at least in New Zealand). However, if social is really about sharing and engaging, the above example (with an added link to a website with full tour details, ticket purchase links and mailing list sign-up) in a well-balanced content calendar is demonstrably more effective. I used to regularly check variance of likes. In the long gaps between genuinely newsworthy band activities, it gave me a sense of how sustainably engaged our following was. Not worrying about our Total Reach, Post Reach, People Engaged and Total Page Likes for a spell was actually a relief. Edgerank hugely inhibits Page’s organic (unpaid) reach anyway with a mere 6% of your audience seeing your content, according to Buffer. 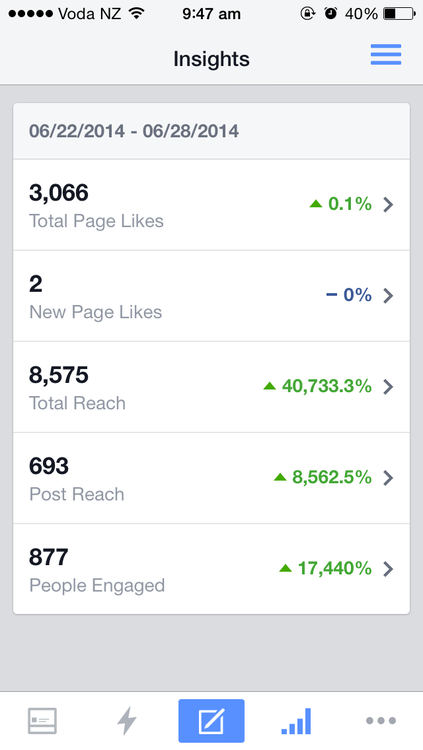 I was bemused by our statistics this week: Post Reach up 8,562.5%, Total Reach up 40,733.3%. OK then! Obviously the results are skewed by relative inactivity in the weeks prior. Take from Facebook’s Insights what you will. Better yet, view it in the context of a strategy that includes more than just Facebook; one that continues to engage your audience through a positive variety and frequency of great content. Could I be doing this better? Absolutely! I’ve been focused on my own personal brand for the last few months, experimenting with content curation via Feedly with optimised distribution and analytics via Buffer. The results so far have been positive in terms of measurable “influence” and activity. I’m excited to apply this to my band. With a new appreciation of the customer experience of how my band and others communicate—particularly around gigs—there is an obvious opportunity to improve how we self-promote. We can manage our brands and channels more effectively. How do you successfully promote your gigs? I’d love to hear about it. Photo credit: David Devo Oosthuizen (supplied).